I think C and D are very similar. I also think something else..
H and then B I think. But we *will* be awarding these at the next tournament. Harley has decided to give up his belt??!! What prompted that...? The real question is, "How feasible and/or expensive would it be to manufacture these buckles with crimson "gem stones" (read 'plastic') for the eyes?" red eyes... that's a really cool idea. Also, do a limited run with concealed blades sheathed in the buckle for when the judge needs to fend off irate players. I like G and H best, can't really decide which... I also have to start seriously considering wearing a belt it seems. ...or maybe I can just pin it to my hat? You know what I think? 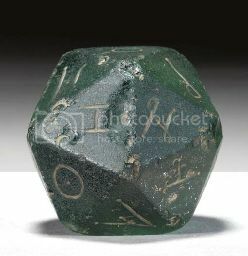 I think we need ball caps with some DCC style that say "Judge" on them to help con and gaming shop goers locate the guys ready and willing to throw down some DCC. Also, I really like hats. If I should find I wore a hat, I would hope the only thing pinned to it was The Pectoral Sky-break Spatterlight ...and if I had to vote a belt buckle it would be the least of evils. Right now it seems like E or H.
Gotta throw my tentacle in the air in support of E for maximum weird n freaky style. Portly Trim, Cleric 1st (Barber) L, AC: 11, Str 10, Agi 11, Stm 8(-1), Per 11, Int 8(-1), Lck 12, hp 5, 21 cp, Razor, 2 x torches, large sack, scissors, candle, Improvised wooden buckler. Fritz, Thief 1st, (Wainwright) C, AC: 10, Str 9, Agi 12, Stm 10, Per 16(+2), Int 12, Lck 13(+1), hp 5, 7 cp, club, flint & steel, lg sack(tomatoes), flask(water), black book, crowbar. Thanks everybody for the votes. I think this helps narrow the choices! Ok this is my first ever post on here...the belt buckle concept is so glorious I must sing its praises. I would of course proudly wear any of them, and I agree that E is probably the finest freaky face... But I like the design of "F" with the eyes and nose between the words. Make it the three eyed monster from "E" and design it so that the upper fangs can be used to open a beer bottle... Yes. H then G are the only ones I'd actually buy and wear. When are they due to be made? I tink these would look good as a sheriff badge as well. What player wants to be looking at their gamemasters crouch every time they play? A badge... the DCC Lawman! --from deep night comes the cruciferiouz king! Thanks to everyone who posted on the belt buckle thread. We just announced the World Tour, where belt buckles are part of the prize. I have the belt buckles in hand -- here is the final version. It turned out great! Now go out and win yourself one! See http://www.goodman-games.com/worldtour.html for more info. ...which one would it be? 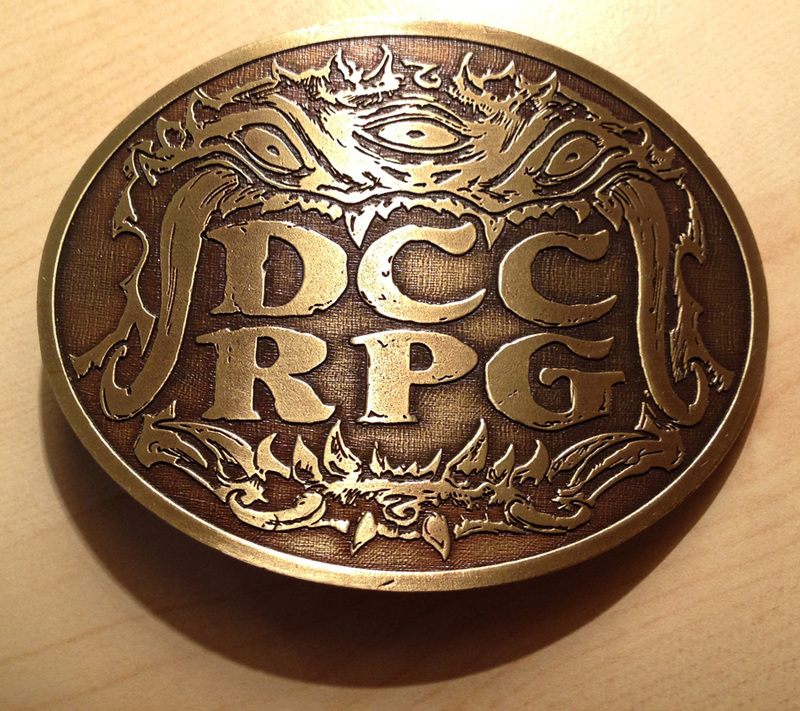 Yes, it's the official DCC RPG brass belt buckle, coming next year. It will be available for free if you run a certain number of DCC RPG sessions at your local stores/cons. More details to come on that aspect of things. But in the meantime, which of Doug's sketches would you like to see in brass around YOUR waist?